VedaMinerals is intended for stimulation of the biologically active zones using tourmaline applicators for restoration of the energetic balance and correction of the pathological conditions. The module is completed with the set of tourmaline applicators. This method of non-invasive acupuncture recreation therapy is capable of competing with such methods as laser and quantum therapy, and is extremely effective during pathological syndromes of Emptiness in TCM or Vata imbalance with low Ojas in Ayurveda. How to place the applicators? Before starting the work with the VedaMinerals module, patient assessment should be done first – heart rhythm recording in a calm condition. Make sure that the recording is correct and edit all artifacts if necessary in the HRV tab, then proceed to the VedaMinerals module. It automatically creates an individual map with the biologically active zones, where tourmaline applicators should be placed on, together with the order of their allocation. This map is formed on the basis of the assessment results and takes information from such tabs as “Dosha balance” and “Organ pulse”. The existing diseases should be chosen in the nosological filter. The map with the zones of stimulation can be saved as rtf, docx or pdf file. 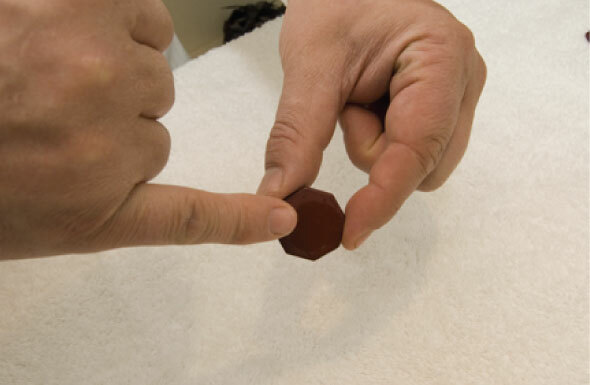 VedaMinerals set has 2 types of applicators – clay (brown) and silicone (red). All of them have tourmaline as one of the ingredients, but in clay ones the amount of tourmaline is higher and they stimulate the zones more intensively. Silicone applicators are used for the neck and facial zone. Silicone is great when placing the applicators on curved places. Remove any remains of the sweat, cosmetics, etc. from the skin. Apply pure water on the smooth side of the applicator. Distribute the water over the surface of the applicator evenly. No dry elements should remain. 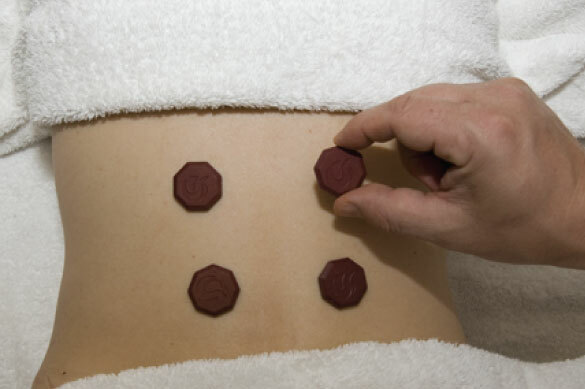 Position the applicators using the acupuncture map, provided in the VedaMinerals module. It is advisable to use a separate set of applicators for each client, because as known in different cultures, any precious and semi-precious gems tune on a person’s energy and it is not recommended for use on another person in order not to transfer any karmic programs. Tourmaline applicators are a type of non-invasive acupuncture therapy, that is why for a person practicing holistic modalities this is completely clear. Anyways, clients, who choose holistic methods of treatment, are also very positive to purchase their own set of applicators and use. Tourmaline applicators, as well as all other holistic methods, are used not as a specific means for the treatment of certain diseases, but more as energetic balance correctors, which is the reason of the disease. From the point of view of academic physiology it is a state of energy deficiency. Low TP (total power) index will be displayed after the VedaPulse assessment. First off, this is the syndrome of Qi Deficiency, which in Ayurveda is equal to Vata imbalance with low Ojas. In addition, tourmaline applicators are very effective during states of Qi (Prana) Stagnation, Blood Stagnation, syndromes of emptiness and pathogenic action of the Wind and Moist. From the point of view of Ayurveda, the applicators are great for people with Vata and Kapha imbalance, because one of the main effects of the tourmaline applicators is heating. Be really careful with the use of the applicators during the Fullness syndrome, especially the excess of Yang (Pitta imbalance). Considering the fact that only TriDosha state can provide free Prana movement, all other types with no doshic balance should use means of compensation. Personal set of the tourmaline applicators can be one of such means, which should be used on a regular basis every time, when Dosha analysis in the Balance tab shows tendency to strong imbalance of Vata and Kapha Dosha. Alternatively, the same biologically active zones, detected using “VedaMinerals” module, can be used for cupping therapy. They are more powerful and result in a strong blood inflow to the zone of application. 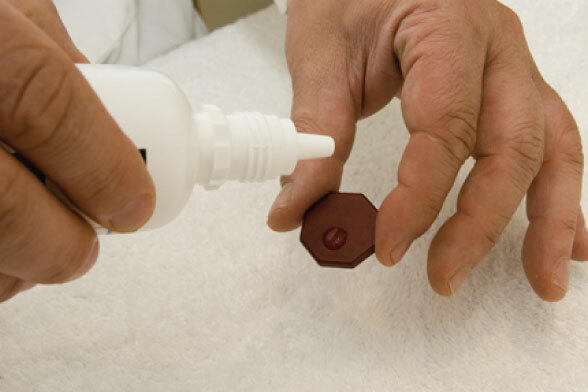 The can be used at acute stages of the disease, and chronic conditions can be corrected using tourmaline applicators. "VedaMinerals" is designed for all professionals, who use methods of traditional medicine in their practice and consult on a healthy lifestyle.